Click Here to get the Weekly Answer & Hashtag on the Code page. Follow @ssshotlist on Twitter or follow on Facebook for reminders. 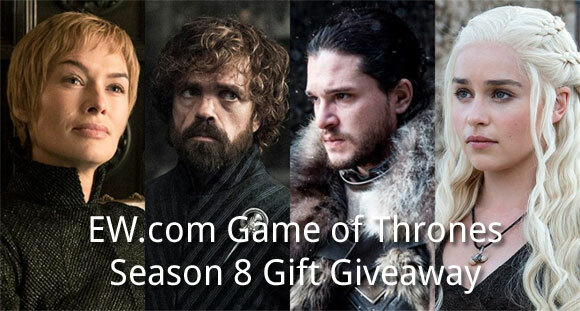 On or about the times indicated above, visit ew.com/tv/recaps to view the Sweepstakes trivia question within the Game of Thrones live blog recap. Correctly answer the question to receive one entry for the applicable Entry Period. If no one answers the question correctly for the specific entry period, all answers will be considered an entry for the applicable entry period. Non-winning entries from one Entry Period drawing will not carry over to subsequent Entry Period drawings. Official Rules: US, Void AK, HI, 18+. April 14 – May 26, 2019. One entry per person per week.